From 1951 to 1992 the Nevada Test Site was the primary location for nuclear blast testing in the United States. 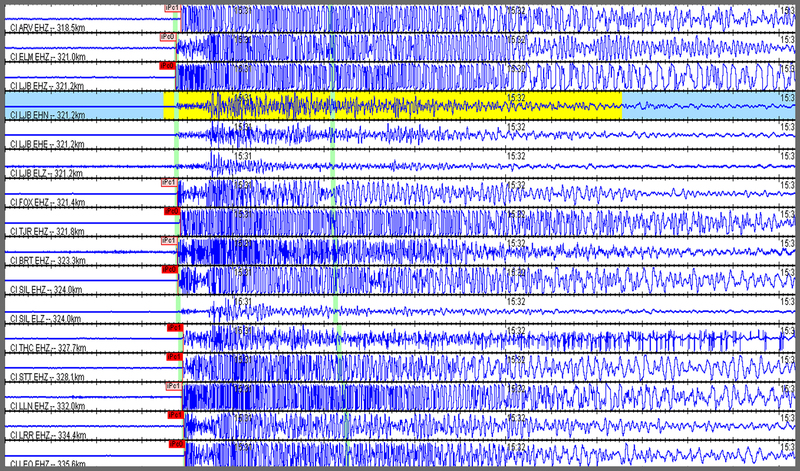 * During this time, due to proximity and station sensitivity, the SCSN was able to locate and catalog the seismic waves generated at the Nevada Test Site, just as if an actual large magnitude earthquake had occurred in Southern Nevada. Because of the uniformly compressional nature of the radiating blast energy associated with nuclear bombs (the first motion of the waves as they arrive at stations is away from the blast, which is upwards on a vertical sensor) these tests were very useful to the growing seismic network. Since the waveforms were guaranteed to point up first, the blasts were used to properly calibrate the polarity of stations within the network and spot problems with analog station installation. Over the years this observed feature of nuclear testing helped to improve the accuracy and quality of the SCSN’s earthquake analysis and reporting. *Note: The United States no longer utilizes the Nevada Test Site for nuclear testing. Below is a sample of 400 out of the >600 nuclear tests that were recorded by the SCSN from 1951 to 1992. Their magnitudes range from 1.9 to 5.8. Use the slider to investigate how the number and distribution of nuclear arms tests has has changed through time (map shows all tests prior to slider date). Clicking on the mushroom clouds shows you the name and equivalent earthquake magnitude of the blast during each test. (for simplicity tests have been grouped where they were performed on the same day). Below is a multi waveform view from Bomb “Montello” on April 1991, which generated a magnitude 5.06 earthquake felt by the network. Click the image for a larger comprehensive view. Note that this window is representing roughly 1 minute of time but the waveform is energetic enough that it was felt by the network for many minutes, which can be seen in the comprehensive view Below.